Over 12,000 Scouts, plus their leaders, canvased the communities of Trapper Trails Council and collected over 410,000 lbs. of food on Saturday, March 19. This food will help support our local food banks and pantries for months to come. 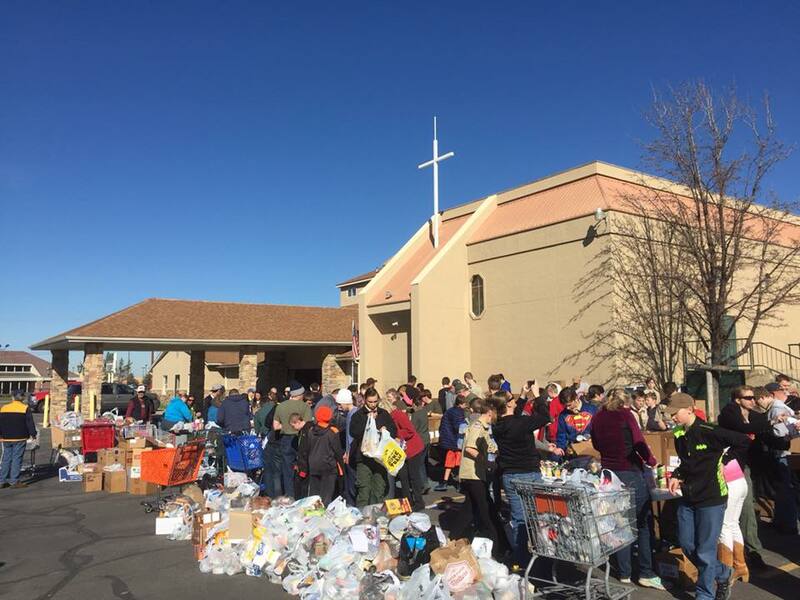 Fish-N-Loaves Pantry, that is associated with the Layton Hills Baptist Church in Layton, was one food pantry that received an immense outpouring of support from the local scouts. 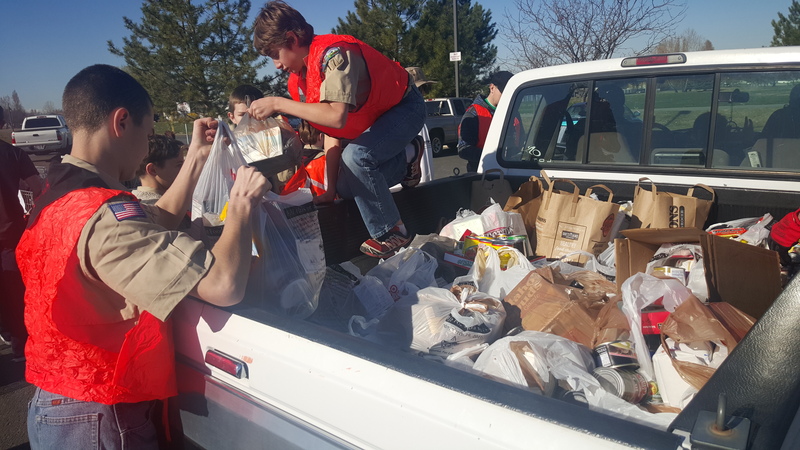 As pictured with a heap of food in their parking lot, it took the help of the local congregation and the Scouts to get it all sorted and in the pantry. The busiest time of the day at each of the drop-off locations were from 9:30 to about 10:45. Load of truck after vehicle after truck would come and drop off the food they collected that morning. Although some locations were still wrapping up with the last donations after 1:30 in the afternoon. At one location, I overheard one leader talking to another, that earlier that morning while their Troop was gathering the food, one of his Scouts asked him, “This is a lot of food, why do we need to gather so much food?” What a great eye-opening experience this youth had, to learn that in his own community there are people that need the service he provided to them. Thank you to our local food banks for the service you provide to our community and for the opportunity we had to ‘scout for food’. 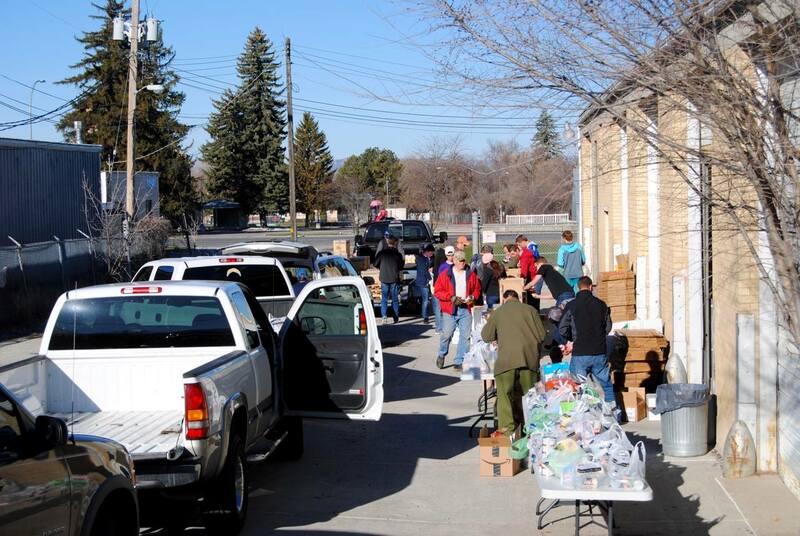 The 410,000 lbs of food went to help the following food banks: Tremonton Food Pantry, Box Elder Community Pantry, Catholic Community Services, Cache Community Food Pantry, Fish-N-Loaves, Family Connection Center, Youth Community Connections, Salvation Army, Ogden Rescue Mission, First Baptist Church in Roy Food Bank, Preston Community Food Pantry and SEICCA’s in Preston and Montpelier Idaho and various food banks in Wyoming.